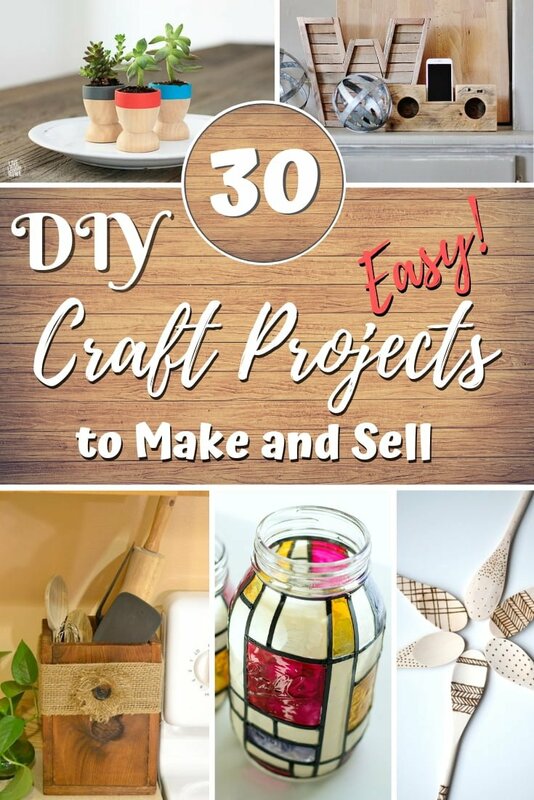 Here are 30 easy DIY home craft project that you can make and sell for profit. There’s no easier way to make money with your handcrafts! 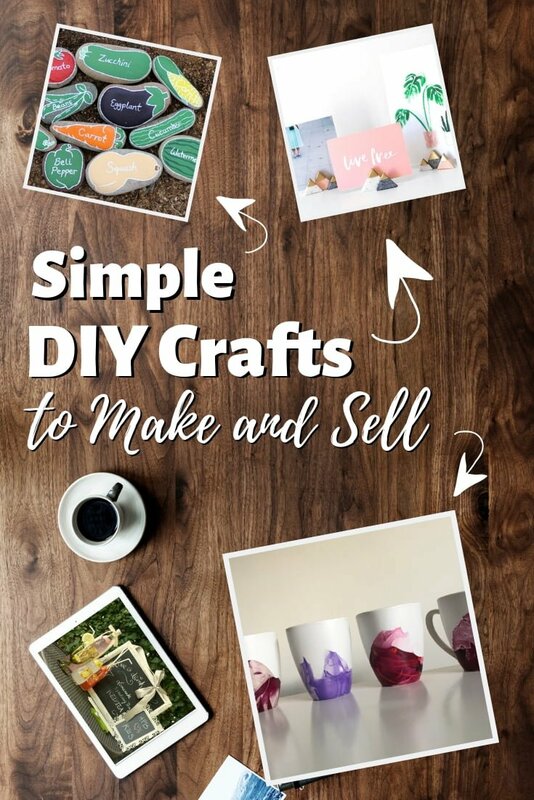 Whether you want to make some extra cash or want to start your own business, there are seemingly endless easy DIY projects to sell once you get the hang of them. 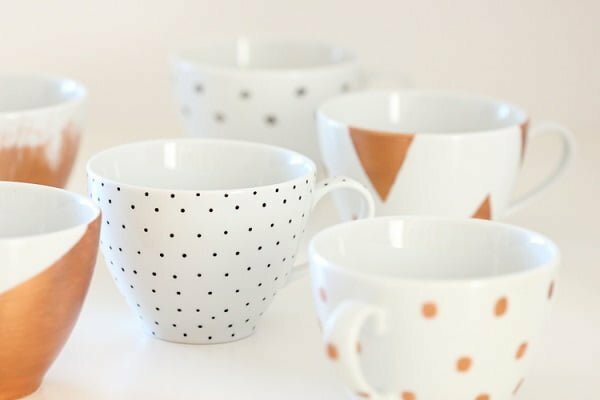 You can create mugs, tealights, woodcraft, and so many other exciting and fun things, which means you get to work with your hands and be creative. Once you’ve made a few, you can sell them at garage sales, craft fairs, or even create an online store where you can sell these items. You can choose one or two from the list below or try them all, giving yourself plenty of things to do when you’re bored. These are the easiest DIY crafts you can make and sell for profit. The tutorials that show you how to do it are fit for beginners, so you will not have any difficulties making them whatever your level of skill. They can be easy to sell too! Everyone who has a green thumb and a little garden at home takes care of it greatly. And that means not only looking after plants but making the garden look pretty. One of the ways to do that is by marking plants and vegetables with unique markers. 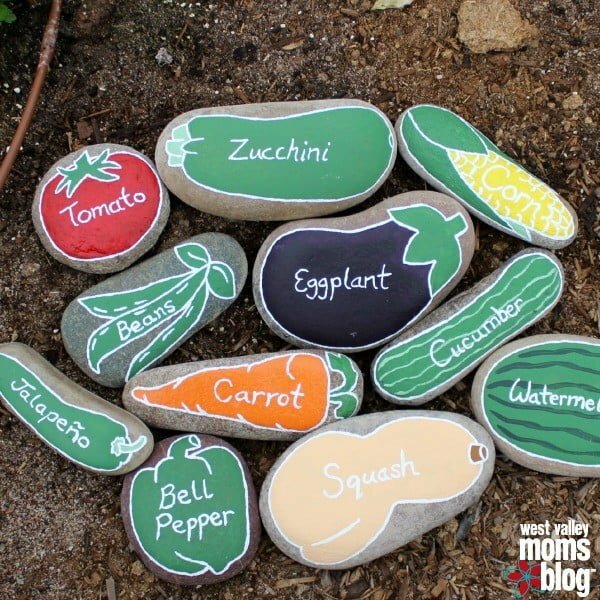 Fill the niche by making painted rock markers for all gardeners out there. Your success depends on how creative and crafty you can be with a paintbrush. Everyone is looking to add charm and character to their home. One of the sure ways to do that is to add vintage accents. A quick visit to a thrift store or a flea market will give you a bunch of old picture frames that can be made into beautiful chalkboard signs. Check out these examples and get inspired to create your own (and sell them for profit). Polymer clay gives you all the flexibility to make unique crafts. 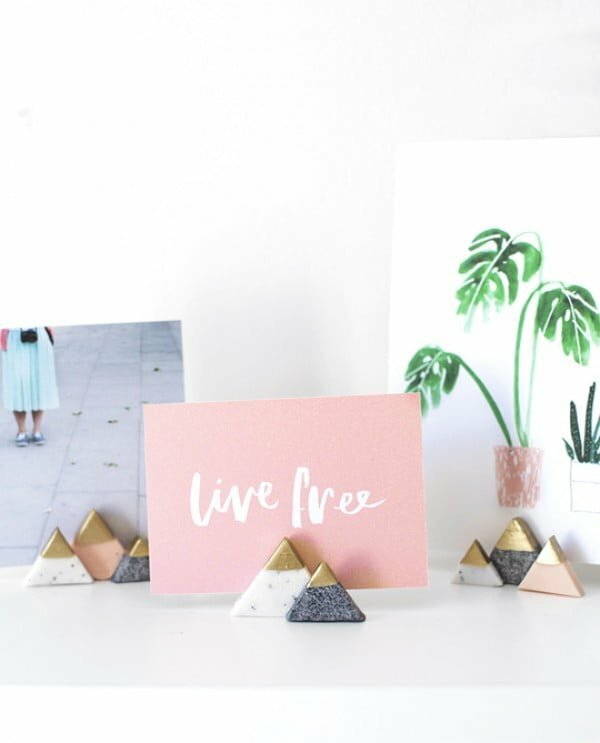 And this idea is about making mini picture holders that can be terrific home decor accents. They are small, so you can make a lot of them once you get the hang of it. And they should sell well on Etsy too. Try this tutorial to see how it goes. Nothing says country home decor like a mason jar light. 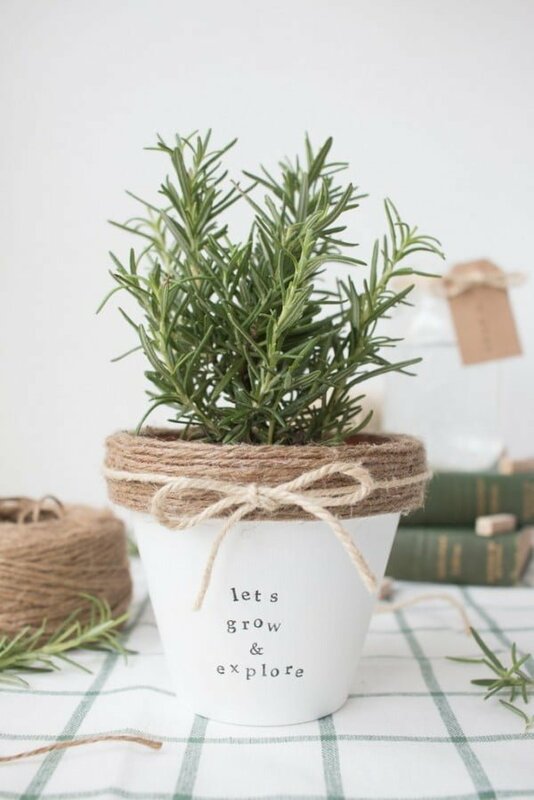 String a bunch together or sell them individually to make some money and give others the chance to have something unique for their home. This tutorial explains all the steps so that you can make these unique lights. Imagine the fun that friends and family members could have when they pair drinking wine with writing on a chalkboard. 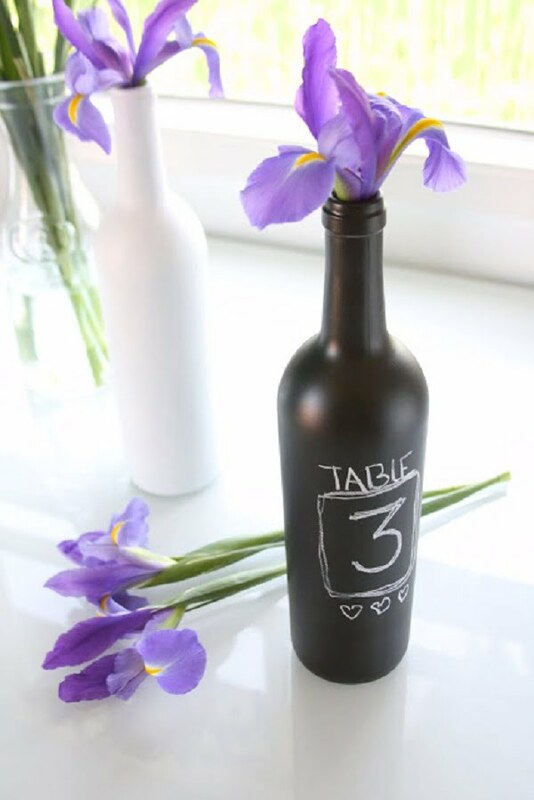 You can create unique wine glasses to sell that includes a small chalkboard with this helpful tutorial. Mugs are the perfect gift for acquaintances, such as co-workers, so many people buy them as gifts. You could make your own and sell them to these people, giving them something unique to offer and giving you little extra spending money, all with using a little nail polish, so check out this tutorial today to get started. Create amazing works of art on mason jars in the Mondrian style. These glasses will look like stained glass when you’re finished and can be used to hold a variety of items. Check out their tutorial now to learn how to make these works of art. Magnets are a fun thing for any age, and you can make your own and have them be unique and exciting. 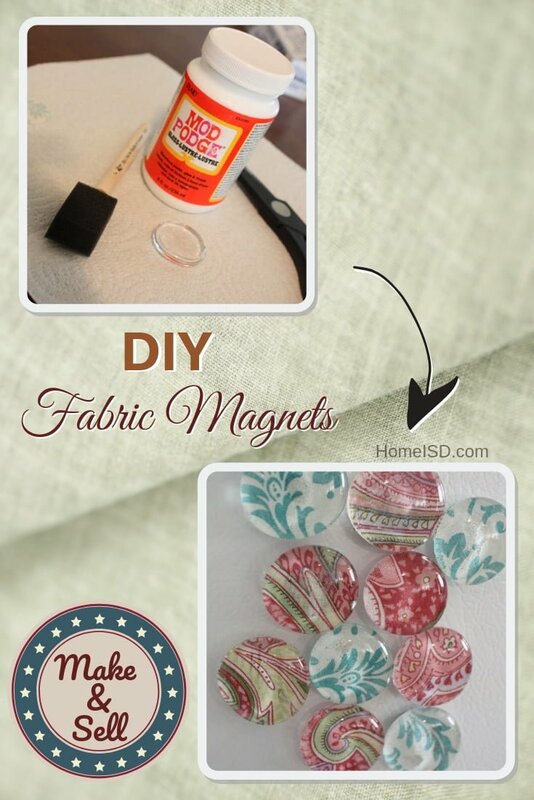 With a few clear gems and some funky fabric, you’ll be well on your way to creating these beautiful magnets for refrigerators and other metal areas, so check out the tutorial and start making some today. Wine bottle crafts are big on Etsy for many reasons. First of all, they are easy to make. Secondly, they make terrific centerpieces in rustic and farmhouse styles. Thirdly, they can be used to mark seats on any dinner party occasion. So you can make them too and try to sell them. 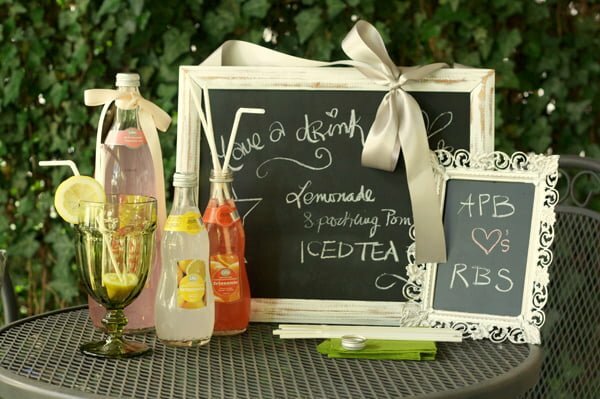 The neat idea is to use chalkboard paint as shown in this tutorial. Transferring images to rocks is an excellent technique explained in this tutorial that you can cash in. 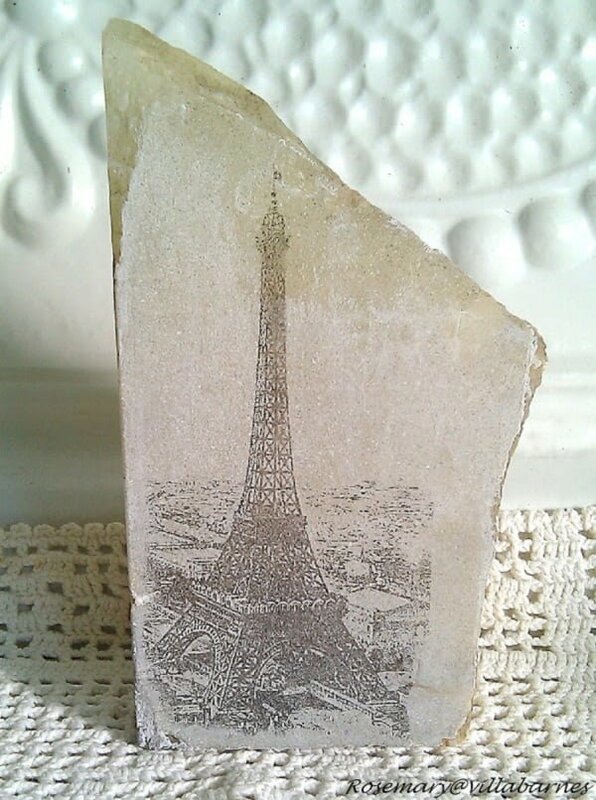 Any rocks with a flat surface will do for this craft. You can even take custom orders from people to make personalized decor items. This project is worth checking out. 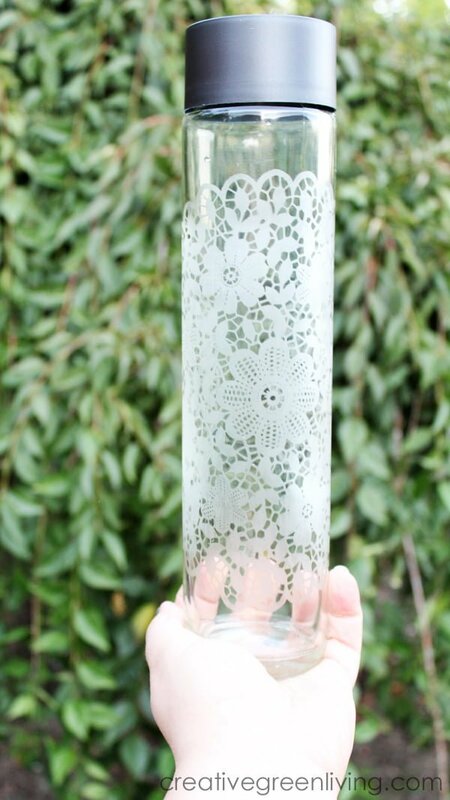 Etched glass bottles sound a lot more complicated than they are. And they sell out like candy. So if you want to make something that is easy to sell, this is one of those projects. Just imagine how many different designs you can create for a varied stock. Try this tutorial to see how easy it is. Hand painting china is one of the most overlooked craft ideas. Take white porcelain dishes that you can buy cheap and paint them in creative designs. What you get are the designer dishes that usually sell rather expensive in stores. So why not make them yourself for profit? Have you noticed how expensive are those designer flower pots? In reality, they are just terracotta pots that are decorated in a design. Can you do it too? You bet! And here’s a tutorial to help you. Every person with a green thumb will buy them from you like candy! Making and selling something form wood is all the rage on Etsy. Everyone is after rustic and farmhouse accents in their homes. Use this trend and make something from wood to sell for profit. These projects require some woodworking skills and necessary tools, but they are certainly doable. 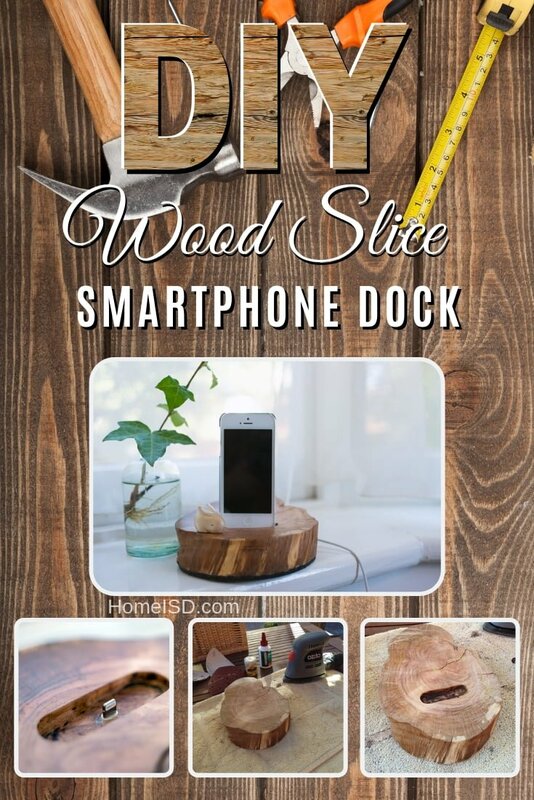 This DIY wood slice smartphone dock is lovely and useful. We can see it easily sell on Etsy. So why not make it yourself? You even get these instructions and tips on how to do it correctly. The project is easy and all you need is a wood slice and charger cable for the materials. You can make several of these in a day. 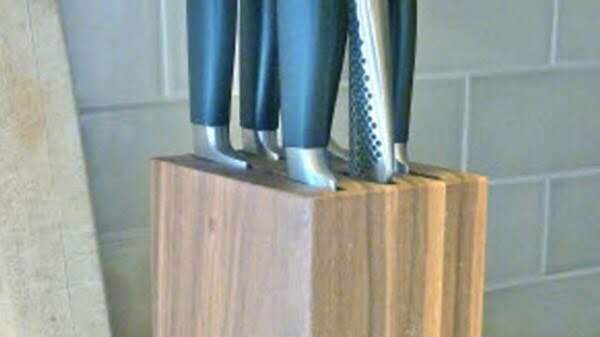 Woodblock kitchen knife racks are popular in kitchen decor, and you can use this trend to your advantage. Making a block from wood is reasonably easy and quick to make. So you can keep making them and keep selling them for profit. You even get a great tutorial to make them. Give it a try. Anyone who has been growing kids will know the value of the ruler chart. Chances are there’s a doorway with notches etched in somewhere in your house too. 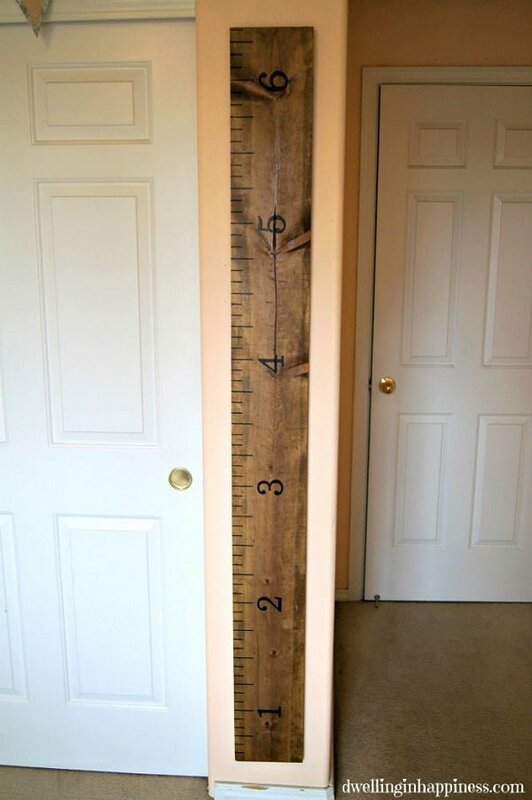 A giant wooden ruler is a great way to keep track of the little ones growing and decorate your home at the same time. It’s another great project to make and sell. 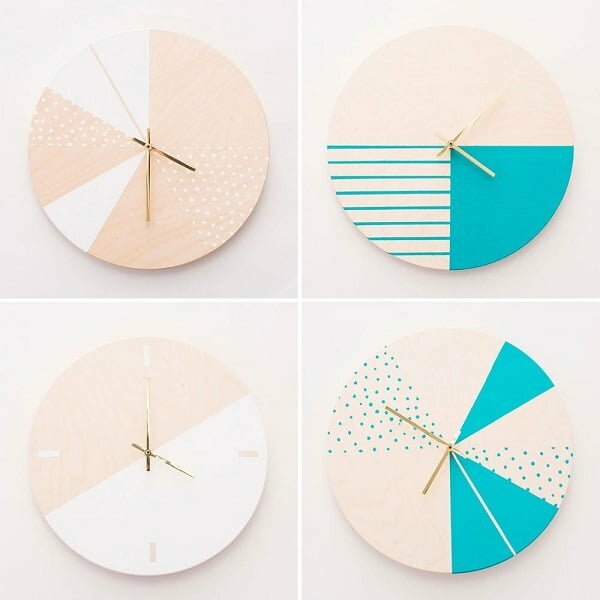 You can make these wooden wall clocks by a dozen. All you need are the clock kits and wood for crafting. The designs are only limited by your imagination. You can take custom orders to make unique wall clocks too. Check out this tutorial to see how it’s done. Want to try your hand at making and selling furniture? If you’re going to do it, start small. 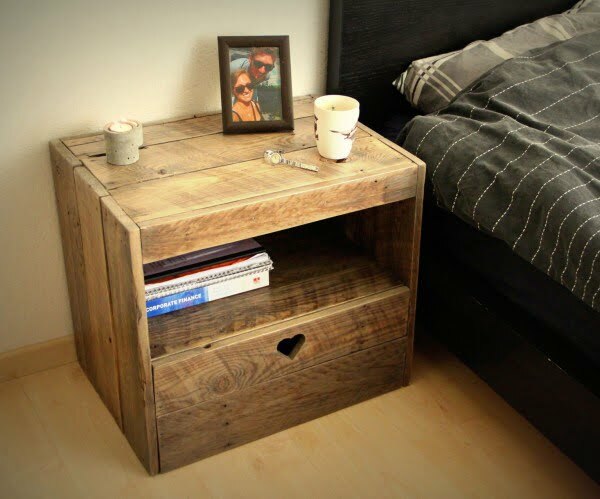 A little nightstand form pallet wood is a great project to try. If you succeed, maybe you can sell it too. The good thing about making furniture is that you can sell it for a lot of money. And rustic custom items have a high demand also. 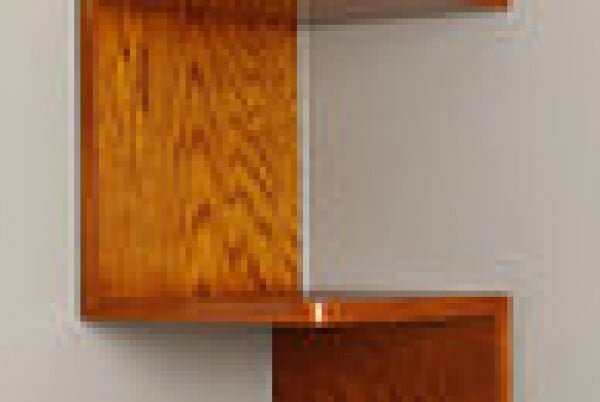 Fulfill one of the most nagging needs of home decor – the corner wall shelving. These are rather easy to make, and you can be sure someone will buy them for their home. It’s one of the easier woodworking projects, especially when you have a tutorial to follow. So check it out. Driftwood crafts are big on Etsy, and you can cash in on that. All you need is to get some good driftwood for your projects. 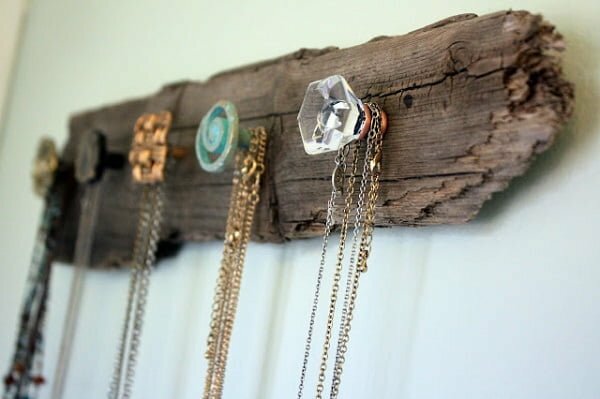 Also get some vintage crystal knobs, and you can make this shabby chic necklace holder. Check out the tutorial for the details. Pallet art signs are all the rage right now, and many homeowners buy them for decorative and informative reasons. You’ll find that this tutorial gives you everything you need to know to make such signs. They also include a free printable, though you can make the greetings whatever you want. These are sure to sell like hotcakes at farmer’s markets, craft fairs, and other areas. If you’re looking for something simple yet elegant, you’ll find that these wood coasters are perfect. They’ve got somebody to them, and you can use a variety of wood pieces. With the right tools and a little patience, this tutorial will give you the skills to make them yourself. For those who have a lot of time and love learning new things, you can learn how to make a wood speaker that doesn’t require electricity. All you need is a smartphone and the speaker box, and you can blast tunes throughout the room. Check out this exciting tutorial now! 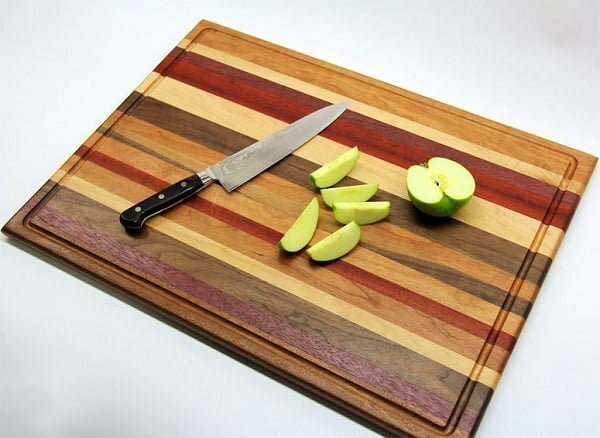 Many homeowners use cutting boards daily to prepare meals. You can get in on the action with a homemade version that is sure to wow any crowd. You can use a variety of wood scraps, which means you can use what’s lying around. Check out this tutorial and start making unique DIY cutting boards today. Do you have a Dremel lying around the house? This heated tool can be used to draw on wood surfaces or etch designs into the wood. Buy a bunch of inexpensive wooden spoons of various colors and sizes, create intricate designs, sell, and repeat. The tutorial will help you learn everything you need to know! Who doesn’t need a few arrows around that point people in the right direction? Businesses and individuals can find uses for wood arrows, and you can make and sell them. You’ll find a variety of styles and options available, making this tutorial pointedly popular. For those who have a green thumb or want to promote nature, these mini succulent planters are perfect! They’re easy to make and perfect for selling or giving as gifts. You can learn more about how to do this project with their tutorial, so give it a view. For those who love wood-working and want to spend a little extra time on each project, you’ll find that the pallet coffee table is right for you. It’s a fun project that makes something truly unique each time. Plus, you can charge a little more because it’s handmade. Check out the tutorial and create this table today. Homeowners everywhere have thousands of utensils that need a home. You can create it for them with the tutorial for a wooden utensil box. With a little handy work and a few tools, you’ll have something unusual that will fetch a reasonable price at the craft fair. The burlap flower adds a nice, rustic touch. For those who want a full-time job or want to impress their friends, consider the print-on-wood tutorial. You can choose almost any photograph or picture, which means they can be highly customizable based on the recipient. They’re perfect for gifts, and you can start a web-based business with such a project. Everyone has a collection of their own. Be it a collection of trophies, collectibles, memorabilia or family heirlooms; they need to display it at home. So display shelves are always in big need. 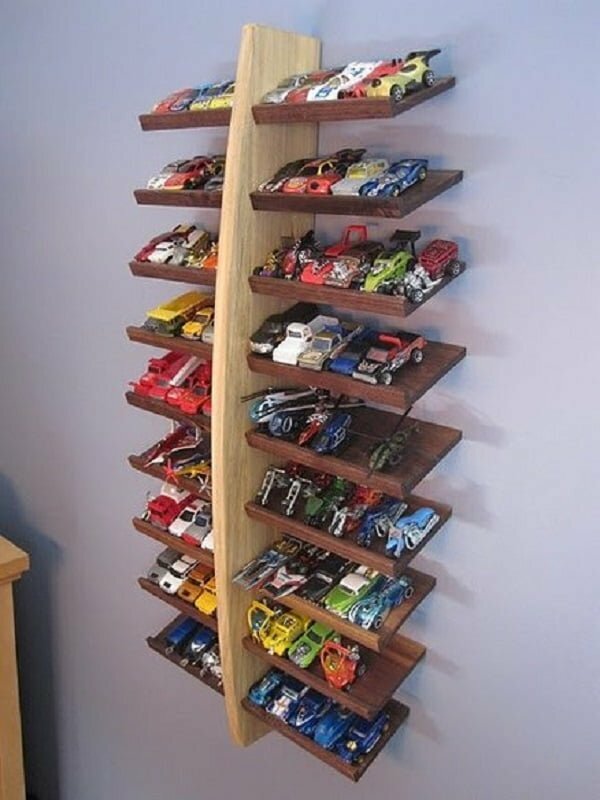 And if you can make unique shelves from wood that you can’t find in stores, it’s going to be a big hit on Etsy. Give it a try.